There are a lot of resources available to Arduino practitioners. Here is a (by no means exhaustive) list of some useful items, grouped in categories. Click on the category name to expand/collapse that list. Arduino Language Online Reference: the complete online documentation for the programming language. Arduino Language Cheat Sheet: a one-page, rather cramped but comprehensive, reference sheet for the Arduino programming language. Arduino Programming Notebook: a very handy summary notebook of Arduino programming constructs and typical circuit elements. Arduino Language Quick Reference: some quick reference examples for the basic programming language features. Getting Started with Arduino: A thorough introduction to using Arduino hardware and software, for those who like nicely illustrated explanations on paper. Tinkering With Arduino: An even more lushly designed enhancement of the Getting Started book. Arduino, A Quick-Start Guide: A systematic tour of Arduino with a good set of sample projects. Beginning Arduino: Another introductory book with a lot of project examples. Arduino Cookbook: A comprehensive collection of how-to recipes for accomplishing a myriad of tasks on Arduino systems. Practical Arduino: Some fairly advanced Arduino projects, well-documented and explained. 30 Arduino Projects for the Evil Genius: Yet another set of Arduino projects. Arduino Starter Kit Manual: Documentation accompanying a starter kit, but works without buying the kit, too. A free version of the “Beginning Arduino” book. Arduino Experimenter’s Guide: Like the ASK Manual above, meant to accompany yet another another kit, but has some good examples. Arduino the Documentary: A 30 minute documentary film that is an excellent introduction to the early history of Arduino. 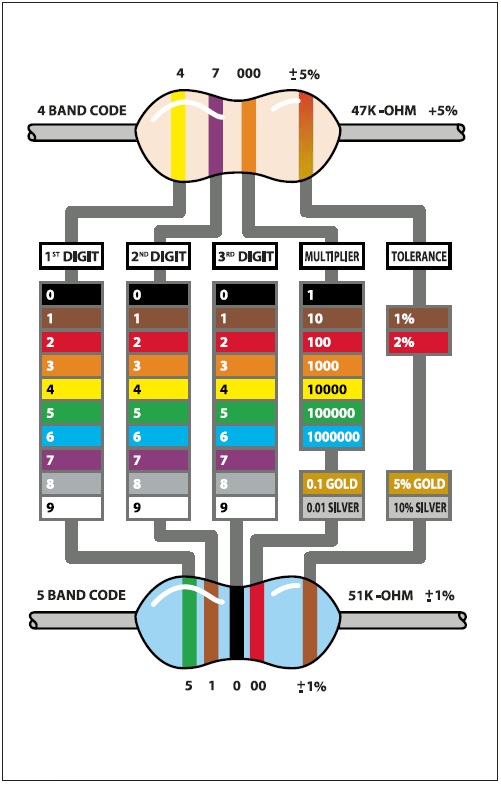 Resistor Chart A really handy chart for decoding the colored stripe codes on resistors. 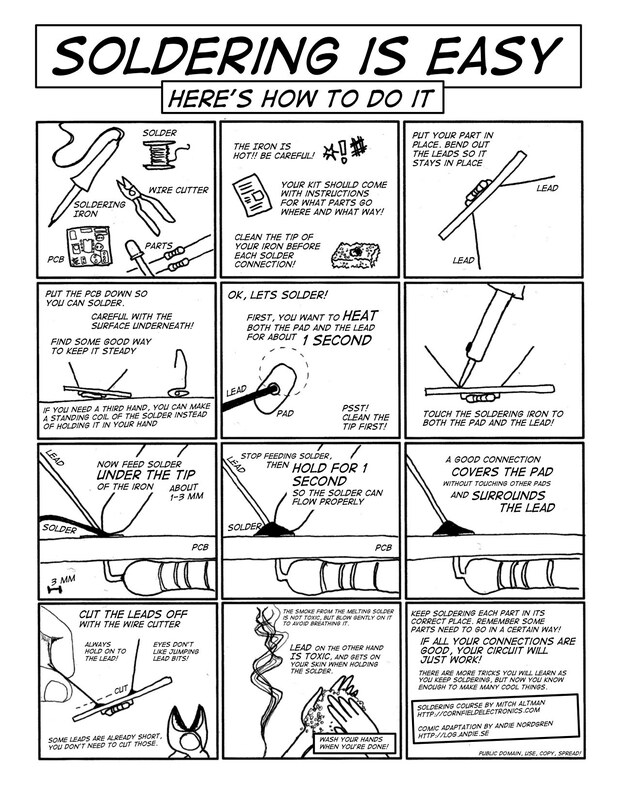 Soldering is Easy A step-by-step poster that clearly illustrates basic soldering techniques. Make: Electronics A beautifully designed book that is a hands-on primer for people new to electronics. Electrical Engineering 101 Very accessible book on the theory and practice of electronics. Getting Started in Electronics An electronics course in notebook format. Practical Electronics for Inventors A complete reference guide for the theoretical and practical aspects of electronics. Arduino Forum The premier online community for Arduino. Adafruit Forum Primarily support for their products, but also an excellent and generous community. Metrix Create:Space Hackerspace, tech shop, workshops, classes: great resource and community, right on Cap Hill in Seattle. Jigsaw Renaissance A community and collective of intellectual eccentrics, passionate about learning and our various arts. dorkbot seattle People doing strange things with electricity: a monthly meeting of artists, designers, engineers, students and other interested parties who are involved in the creation of electronic art. Leah Buechly: The MIT Media Lab professor who developed the LilyPad. Is the Rise of Wearable Electronics Finally Here? : A survey article about all kinds of wearable technology projects. Adafruit Industries Maker of Arduino kits, supplier of parts, curator of offerings — awesome documentation, too. Sparkfun Electronics All things for the electronics hobbyist, with lots of Arduino and LilyPad stuff. Maker SHED DIY central, including Arduino, and lots more. Radio Shack Electronics supplies, with bricks and mortar sales. Vetco Electronics Mostly industrial electronics supplier, in Bellevue, but they sell to hobbyists. Ada’s Technical Books Great technical book store, on Cap Hill in Seattle, also with kits, puzzles, gifts, etc.